You are going to start seeing a lot fewer blog posts from Chicago and a lot more from St. Joseph County. 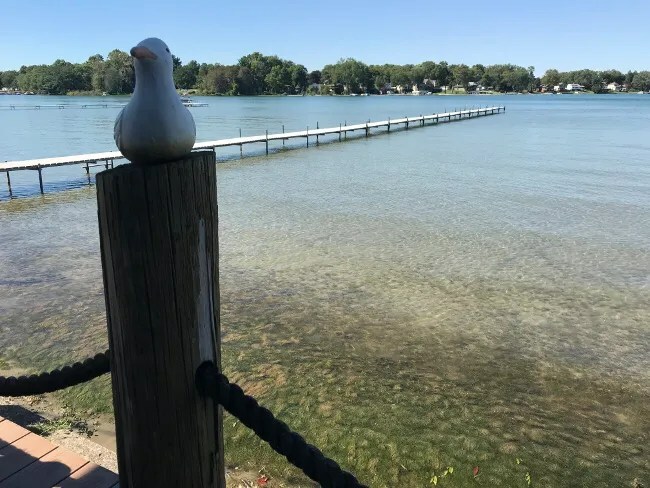 J’s parents are in the process of selling their home in the Chicago suburbs and moving to a lake in rural St. Joseph County. The move is being done a little at a time. They closed a few weeks ago and have slowly started adding all the basic services and getting some new furniture into the house. The big move will happen next week but until then, they’re going back and forth to Chicago on days they don’t need to be here. Last weekend, J’s dad came up by himself to wait for an appointment on Monday morning. He had some furniture to put together and the kids are really excited about this new house so they wanted to go see him. J worked until noon on Sunday then we got everyone into the car and headed south. We planned on eating along the way but our first choice in Centreville is closed on Sunday. I quickly found a back up not too far out of the way. 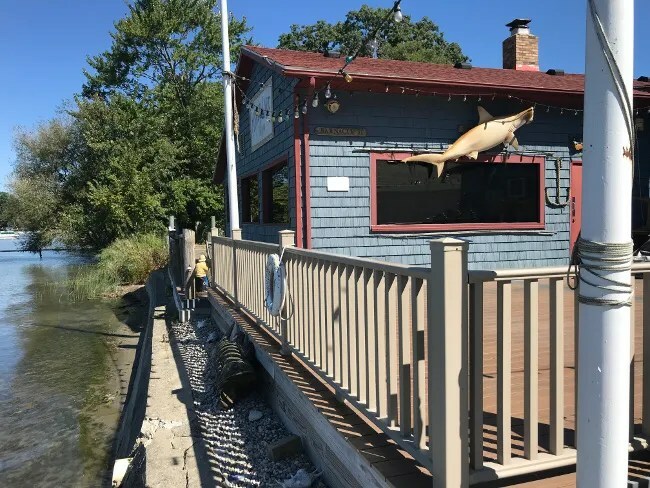 Fisher Lake Inn is a St. Joseph County staple. It’s been on Fisher Lake since the mid 1980’s. 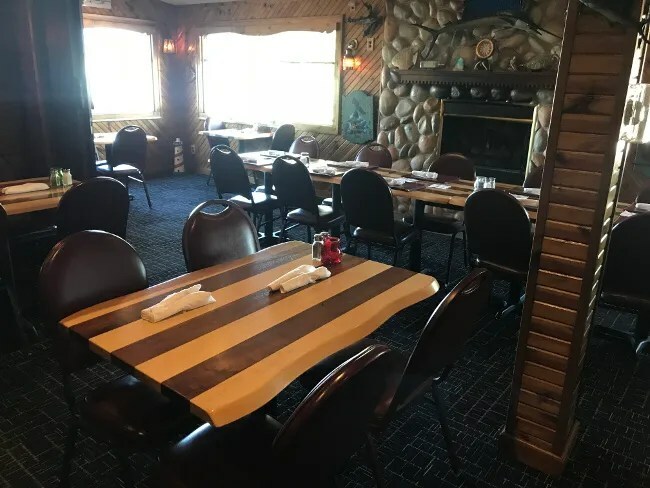 The restaurant is on M-60 on the southeast side of the lake south of Heimbach Road. 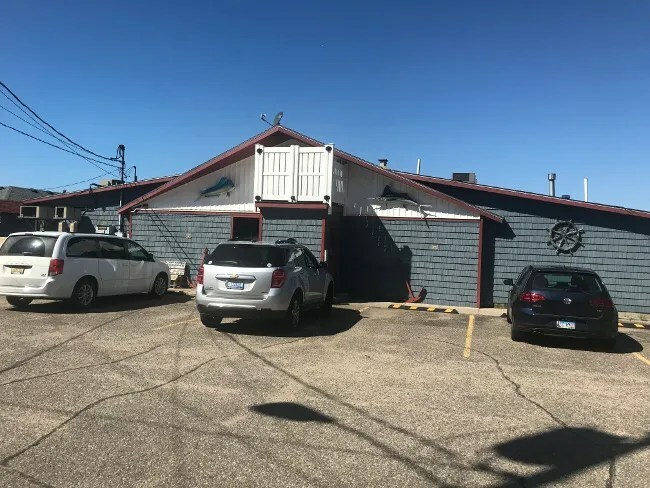 There is a small parking lot in front of a pretty non-descript blue building with no windows on in the front. We walked a little before 1:30 on Sunday afternoon. Immediately inside the entrance is the bar area. It’s easy to see right away that not much has changed since the place opened. It has a very 1980’s themed casual dining restaurant. 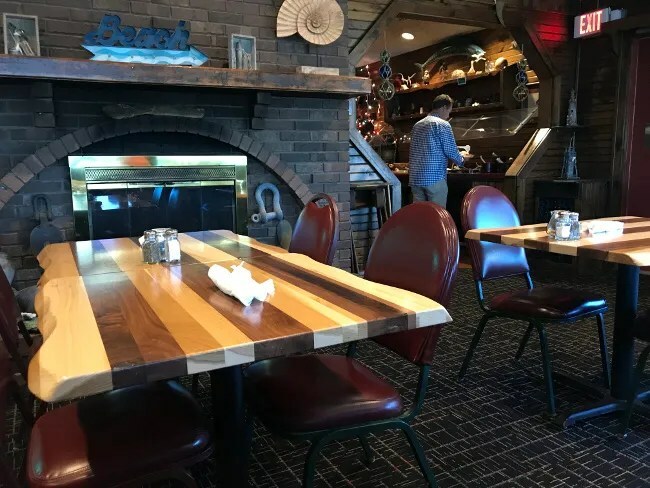 There are stone fire places in the dining rooms, large fish hanging from the walls, dark green carpet on the floors, wood slat siding on all the wall surface and several pictures and trinkets to carry on the nautical theme. 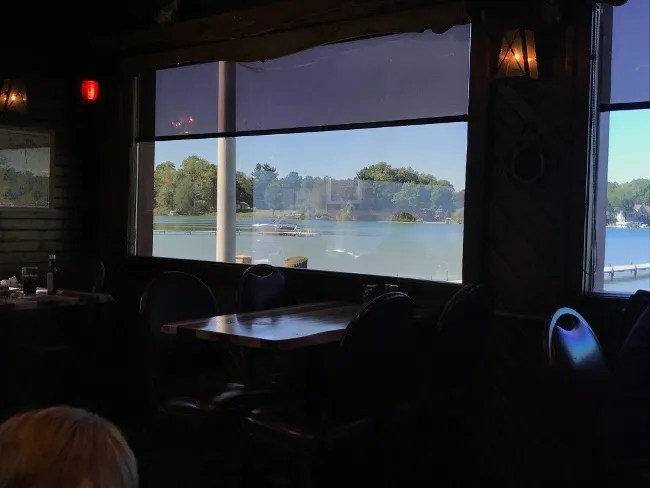 The dining rooms are are lit pretty dimly but there is quite a bit of natural light that comes in during daylight hours from the large windows that look out to Fisher Lake. The lake is a big part of what makes this place popular. Not only are the views great but there’s a dock just outside the back door big enough for several boats to dock at once. Homeowners and lake users can take the boat across the lake for dinner instead of having to get in the car. There’s also a nice big outdoor patio area which, again, takes advantage of the restaurants proximity to the lake. The nautical theme continues outside with more fish hanging from the walls and wooden seagulls on many of the posts holding the dock up. The hostess took us to the back dining room which overlooks the lake. I know she thought she was doing a good thing by doing that. It’s a great view and it’s where most people would want to sit, but our kids were not being the little angels we know they can be…at least one of them wasn’t. The dining room tables look to be one of the more recent additions to the restaurant. They’re a really nice, solid wood slat table. All of the tables right next to the window were being used so we were put in the middle of the restaurant in the second row. Fisher Lake Inn is the kind of place that has both a lunch and a dinner menu. We assumed, since we were going at lunch time that we would get the lunch menu. We did not. We got the dinner menu. There are more entrees and more fish on that menu and less sandwiches. We were still able to find something we wanted to eat but there were not as many options as there would have been with the lunch menu. I picked the Lake Burger. 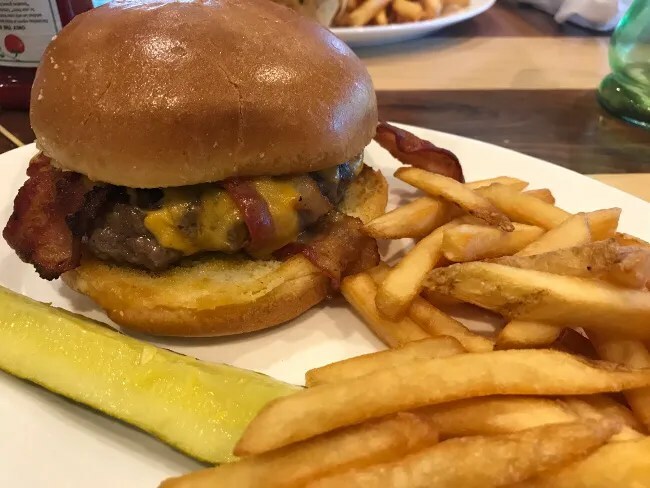 The sandwich is a half pound beef burger on a grilled bun with choice of toppings….but they don’t list the toppings anywhere….or tell you that the toppings are extra. I assumed they’d have cheese and bacon so that’s what I ordered. I don’t remember the price but I know both were charged on top of the price of the burger. The sandwich was actually really pretty good. The meat was a really juicy, loosely packed ground beef that was covered in melted cheddar cheese. The bacon was nice and crispy and the dense, grilled bun was a nice way to bring it all together. The sandwich comes with fries. They’re skin on, frozen fries with a touch of salt on the finish. J ordered the Chicken Wrap. 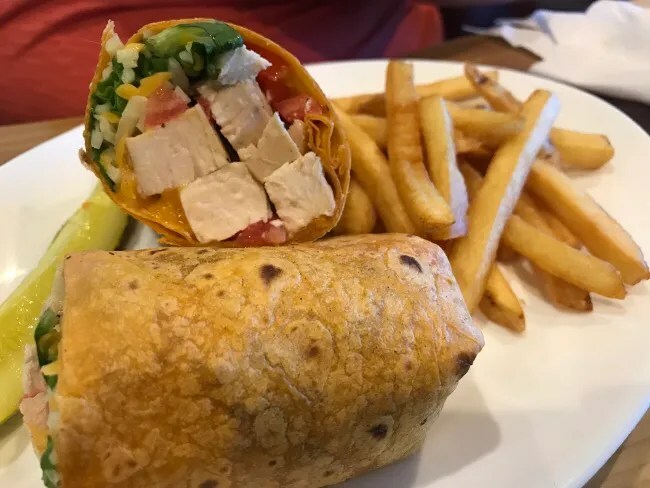 The warm tomato wrap is filled with grilled chicken, red onion, grape tomatoes, greens, and monterey jack cheese. She really would have preferred crispy chicken in this over the grilled chicken so she didn’t eat much. There were large chunks of grilled chicken which most people would be happy about. There was definitely more chicken than filling in this wrap, but it’s not how J really likes wraps. She ate about half of a half and kind of picked at the veggies before boxing up the other half to bring to her dad for later. The kids shared a meal by getting the kids chicken tenders and adding on a salad bar. 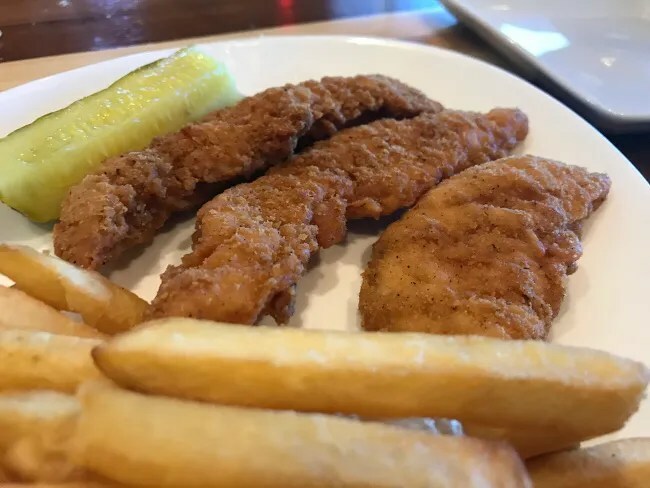 The chicken tenders were simple frozen tenders cooked to a nice golden brown. The meal also came with fries which the kids also split. We also asked for a kids drink for B. He wanted milk and can’t be trusted to drink out of a glass yet. They gave us a disposable coffee cup with a straw in the open flap that you would drink out of. That doesn’t do much good because he’s still going to spill it as he tries to drink. This was a big source of the attitude we were dealing with while trying to eat lunch because he doesn’t want help. He wants to do it himself but he really can’t do so without spilling. So, that led to some fighting…and screeching…and crying to the point we had to get him out of the dining room until food came…and then immediately after he was done. L was much more in to the salad bar which is typical for her lately. The salad bar is a throwback to the places I ate at a lot growing up with my parents. It’s included with the entree options or you can purchase it as a meal. My mom works at a restaurant similar to this and there was talk of taking away the salad bar and people almost rioted. It’s a very 1980’s eating out kind of thing and not something you see in newer restaurants. L loves it. if she can get a pile of salad and drown it in ranch dressing, that’s a solid meal to her. Our bill ran a little under $55 before tip. We were mixed on Fisher Lake Inn. J wasn’t really a fan. She didn’t really like her wrap the way it was prepared and the menu had limited options unless you want a steak or seafood….which we almost never do. I enjoyed my sandwich and the place really reminded me of home. 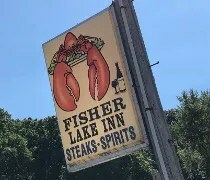 Fisher Lake Inn is a throwback. That’s the best way I can describe it. It’s from an era when casual dining meant something else. You’re not going to find fried eggs on burgers or avocado toast on the menu. 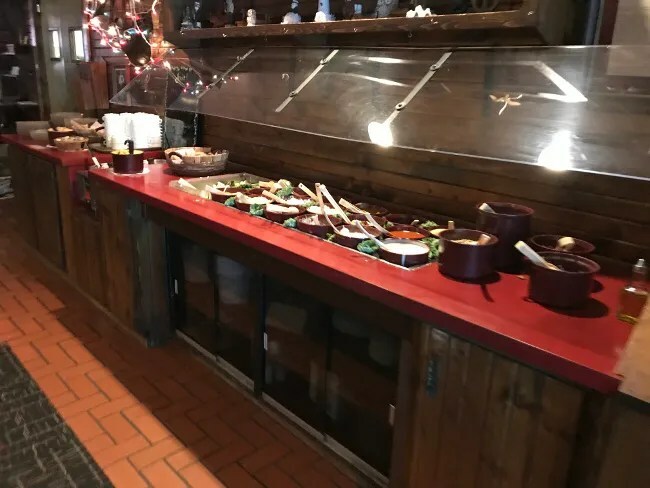 What you’ll find is a hearty meal that includes soup and a salad bar. I really think it’s a place my in-laws will enjoy once they get settled and it’s a nice Harley ride from their new place.